Tony Stark: *gives up being Iron Man* Five minutes later: "Okay, I'm back." 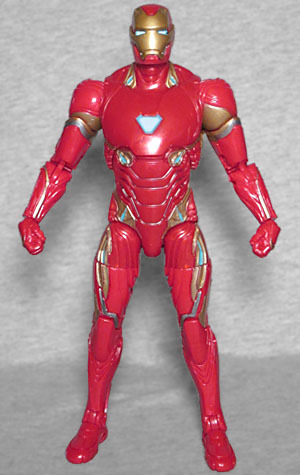 So there's something we've noticed about the Iron Man movie toys: Iron Man 3, Mark 42 Armor, new sculpt; Avengers 2.0: You Can (Not) Advance, Mark 43 Armor, repaint. Civil War, Mark 46 Armor, new sculpt; Spider-Man: Homecoming, Mark 47 Armor, repaint. Basically, we're saying don't be surprised when this mold shows up again in the Avengers 4 toyline with a slightly new color. 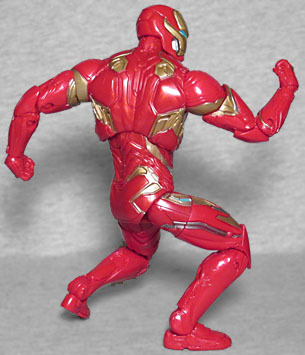 The nanotech Mark 50 Armor is based on the comics' Invincible Iron Man armor, with its ability to form new weapons as needed from its own material. There are also hints of the Bleeding Edge armor, with the seeming adundance of repulor ports all over the thing and the fact that the colored areas of the suit take a lot of angled, meandering paths rather than being big straight lines. Bleeding Edge for form, Model-Prime for function. This still manages to look like a design evolution of what's come before, in part due to the lines over the stomach, which are the same basic shape here as they were a decade ago. All the edges of the suit are molded cleanly, and there are even two little notches taken out of the chest so the repulsor ports remain completely visible even when the chest isn't flexed back. 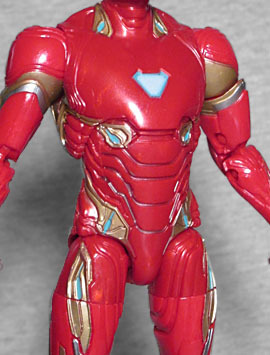 The colors on the toy are lighter than Iron Man looked in the movie. He appears to use the "swirly" plastic to create a metallic look, but that can be accomplished other ways. The gold is nice and shiny, and that didn't need to be molded from semi-translucent plastic, did it? Of course not. The colorscheme is accented with a few spots of silver and blue for the repulsors. And because of the plastic choices, the limbs don't match the torso. The articulation is good. Tony has a balljointed head on a hinged neck, meaning he can look up for flight poses or down when Peter tells him his shoe is untied. The arms get swievl/hinge shoulders, swivel biceps, double-hinged elbows, and swivel/hinge wrists. The torso is a full balljoint, allowing him to swivel around impressively. The hips are balljoints too, with a very nice range of motion. There are swivels cut straight through the thighs, double-hinged knees, and swivel/hinge ankles. So there's plenty of movement, but there's something else missing. Iron Man's only accessories are alternate "repulsor blast" hands without the wrist hinge ("the" new thing for Iron Mans lately) and energy effects to fit into said hands. Really? That's all? Nothing else? The entire point of this suit is that it can build big new crazy add-ons at a moment's notice, but we get none of them. We don't even get a Build-A-Figure piece, so it's not like they would have conflicted with the budget there. He should really have come with something more. Without extra accessories and without part of the BAF, this Iron Man really isn't one that's necessary, especially since both Figuarts and Marvel Select have versions that get appropriately accessorized.